Once we got ahead on our fishing game, we started looking out for higher-end fish finders. But everything we looked at felt too sophisticated and was priced to match. So we wrote down our priorities and went fishing for a mid-range fish finder that could be used by both professional and expert recreational anglers. Lowrance Elite 5 HDI fish finder filled in that spot nicely. This is an all-rounder fish finder that we recommend to everyone since its middle-of-the-road feature set appeals to a wide audience. With many surprises like the HDI and Navionics capability, this unit baits all its value for money. Elite 5 HDI vs Hook 5? The feature set of the 5 HDI fish finder became so popular that Lowrance retained them all and packaged them into a more user-friendly and advanced unit, the Hook 3 DSI. The direct competition to the Elite 5 HDI fish finder from another brand is the Garmin EchoMAP 50s. But it doesn’t have 3D imaging like the HDI. If you are an advanced recreational angler or a professional angler with moderate experience, Elite 5 HDI will fit in nicely with your requirements. It can be mounted on vessels of any size for fishing. If you want everything but the kitchen sink in your fish finder, the HDS-9 is a better choice. The USP of the Lowrance Elite 5 HDI fish finder is its special set of features that work for everyone. You have SONAR-only and Mapping-only units named Elite 5. But we have reviewed the Elite 5 HDI which has both. The Elite 5 HDI fish finder is compact yet isn’t cramped for space. The majority of the left side is taken up by a 5-inch screen. We liked the square structure of it when using the HDI display. This is a Full VGA SolarMax Plus color screen with 256 colors display. It has a resolution of 480x480 which is sufficiently high for this screen size. Anything more would count as luxury. The backlit screen allows you to view the graphics even in the brightest sunlight of Florida. The buttons are on the right side of the screen. Do note that this is not a touchscreen device. The buttons are cleverly assigned, keeping in mind the most frequently used actions. There’s a multidirectional pad with a Select key in the middle. Menu and Enter buttons are separate. There’s another set of +/- buttons for zooming and Main OverBoad. With all the keys on one side, it can be operated with a single hand if the need arises. 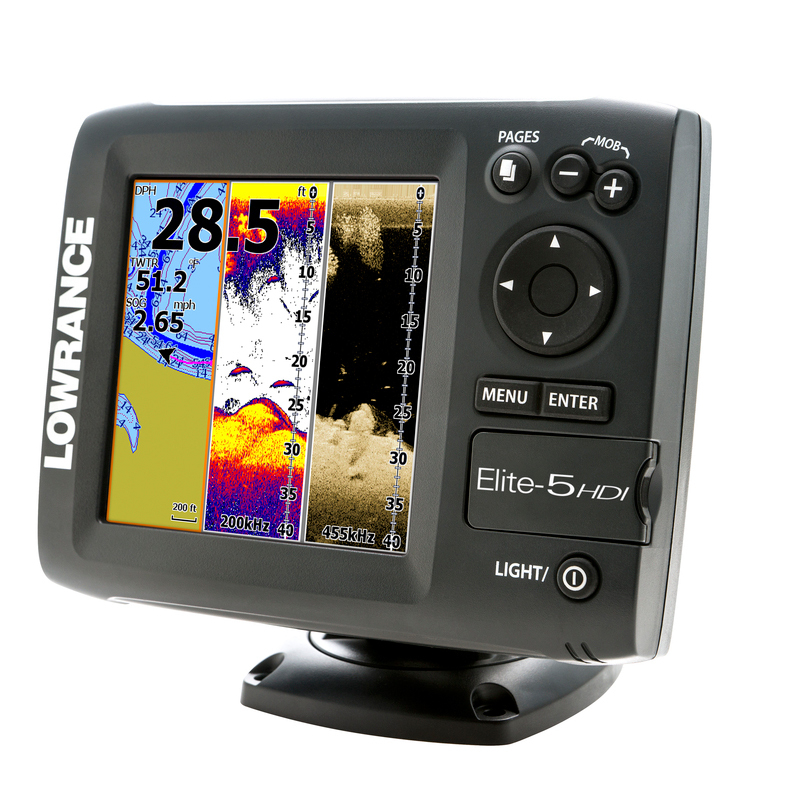 The Lowrance Elite 5 HDI fish finder comes with both transom and trolling mounts. Adapter kits are also included. There is only one transducera for all the frequencies, so installation is clean and simple. The fish finder itself needs only a small, flat area to rest. The fish finder measures 6.9 inches in width, 5.4 inches in height and 2.5 inches in depth. It is IPX7-rated waterproof. It has one SD card slot and NMEA 0183 connectivity. The design makes it easy to tilt or swivel the device. The fish finder fits into the same cutouts as the older 5-inch models from Lowrance. The Lowrance Elite 5 HDI fish finder has the dual-frequency 2D SONAR. The dual frequency cones give you both clarity and depth without compromising on either. Based on the model you pick, you can have either 50/200 kHz or 83/200 kHz SONAR. The 50/200 kHz model is best for deep-water fishing. This beam also has sharper and deeper penetration into saltwater. The 83/200 kHz model is best for shallow waters or freshwater. This offers more details than the 50/200 kHz beam. The maximum power that it puts out into the water is 250W RMS. That’s plenty for spotting fish without taxing the boat’s supply too much. The Down Scanning is more distinctive than the traditional SONAR but it’s cheaper than Side imaging. DownScan gives you a proper view of the underwater structures and the bottom of the water body. The view right under the vessel is clearly depicted with schools of baitfish, logs, foliage all looking more distinguished from each other. Here are side-by-side images of 2D SONAR and DownScan. Notice how DownScan helps identify objects with more detailed images while traditional SONAR has a much wider beam which covers more area. The Lowrance Elite 5 HDI fish finder brings you 455/800 kHz dual-frequency down imaging. These two beams ensure that DownScan scans a wider area (compared to single-frequency down imaging) and also collects more details about the underwater life. The Elite 5 HDI fish finder has something called the Hybrid Dual Imaging, its namesake technology. 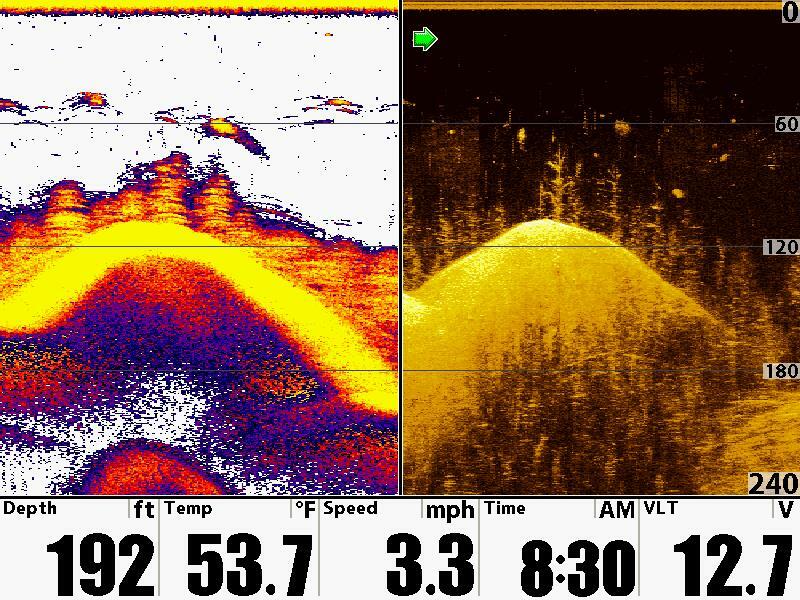 This splits the screen in half and shows both traditional and DownScan SONAR images together. This allows you to exploit the benefits of both side-by-side. DownScan is best used to identify structures like schools of fish while traditional SONAR is better at watching individual fishes. With this particular feature, you can overlay the DownScan on 2D images so that you can see every submerged object and also the single suspended arches that may be fish. Do note that this is not a split-screen functionality like the HDI. Here all the details are on the same screen allowing you to easily spot where the fish are hiding using the power of both types of scanning simultaneously. The Elite 5 HDI fish finder has an internal 16 channel GPS antenna with WAAS+EGNOS+MSAS precision for navigation. The unit is also capable of using an external antenna. These basic GPS maps cover at least 3000 US lakes and 1000+ coastal areas. All the Gold versions of this fish finder have Navionics maps for navigation which are pretty comprehensive. You can also expand the mapping via the SD card slot. This unit is also capable of hosting Insight Genesis. It’s a paid subscription but it allows you to track the SONAR data of a place and convert it to customized maps easily via the Lowrance software. The in-built memory of the Lowrance Elite 5 HDI fish finder can store up to 3000 waypoints on the paths you are travelling. These can help mark places where you found the fish biting or places to avoid. You can also use the TrackBack feature to revisit past SONAR images and mark waypoints on them. You can save up to 100 routes and 100 retraceable plot trails. With the Elite 5 HDI, you can split the screen into three panels for viewing maps, 2D SONAR and DownScan. The way the screen is divided, it can get a little cramped for a square screen. There are other preset Views which offer a choice of the way screens are split, e.g. : SONAR/GPS, Frequency1/Frequency2, etc..
Other features of this Lowrance fish finder include Depth and Shallow Alarms, GPS Alarms and temperature sensors. Its Advanced Signal Processing automatically adjusts the SONAR tuning based on the reading, turning it into an intuitive device to use. 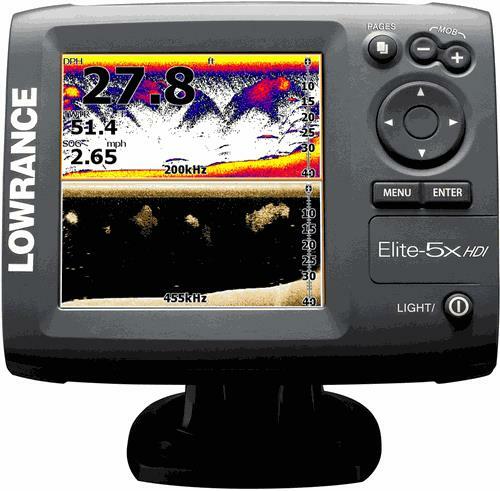 The Lowrance Elite 5 HDI fish finder has a huge fan base that has now also caught up with the newer and similar Hook 5. The 5 HDI is touted as the unit that’s pretty cool for recreational anglers and one that serves all the purposes of the professional fishermen too. Being a Lowrance product, it is pretty reliable. The feedback on the product itself is positive given all the features work fairly straight-forward. It is an excellent fish finder both in terms of presentation and ease of operation. We do hear that its operation manual should have been clearer and we agree. A fish finder with such diverse features should be properly supported by a comprehensive help document. 1. Make sure that you are using DownScan and Traditional SONAR in their correct respective frequencies to get clear images. The DownScan operates at 455/800 kHz and the 2D SONAR at either 50/200 kHz or 83/200 kHz. 2. DownScan Overlay will merge the traditional SONAR and DownScan, so turn off the overlay if you want to see both separately in HDI mode. 3. You can choose color palettes for viewing the SONAR images. Based on which works best for your eyes, you can choose the palette and get a better picture. 4. If you plan to use this fish finder on a kayak, you can mount the transducer inside the hull on a level area using a proper adhesive like silicone. 5. Get Insight Genesis if the map of your area is not available on the in-built maps. You can scan the area and create your own SONAR map with it. *Noted: This product was discontinued by the manufacturer. You can check it here. We have always been conservative shoppers. So we look for good value within a budget. 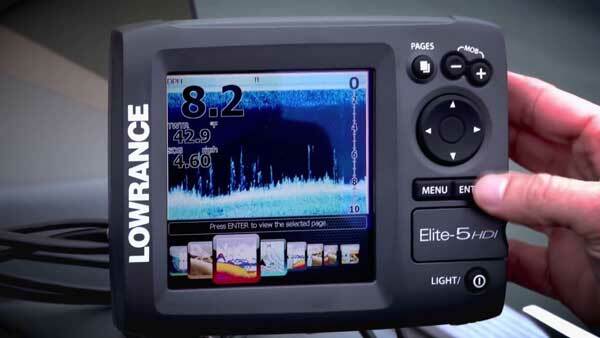 The Lowrance Elite 5 HDI fish finder struck us as the product with generous but only relevant features. Lowrance ensures that you get the best visibility under the vessel with DownScan, Traditional SONAR and the overlay of both. The mapping function with expandability via Insight Genesis has the flexibility to serve professional anglers. My Elite 5 HDI will not ‘Acquire Position’. Went fishing yesterday & when I turned on the unit it remained on the lake I had fished last week. ???? You may want to try performing a factory reset to see if that helps. You may also want to contact Lowrance Support for assistance.